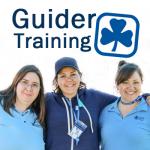 Guider Training is Fraser Skies Area’s adult training sessions for Guiders and Unit Assistants. All sessions are held at the Fraser Skies Area Office (#102- 26620 56th Avenue , Langley, BC) unless otherwise indicated. Come out and learn some new skills and meet fellow members. You can horizontally scroll table to view registration links in mobile. Thurs. Mar 21 Girls First Platform A little wary about the new program platform? Not sure how to use it? Come out and play around with the platform. All levels of users welcome.